We will leverage various data sources which were described in Part 1, mostly based on MSCI data series for per-country stock historical returns (in USD and in local currency) and OECD for per-country inflation rates. Using the MSCI World data series and currency exchange rates, we also obtained 16 data series expressed in local currency of such World index. In addition, we will leverage the 16 domestic bond data series that were modeled in Part 2, based on OECD/IMF interest rates. 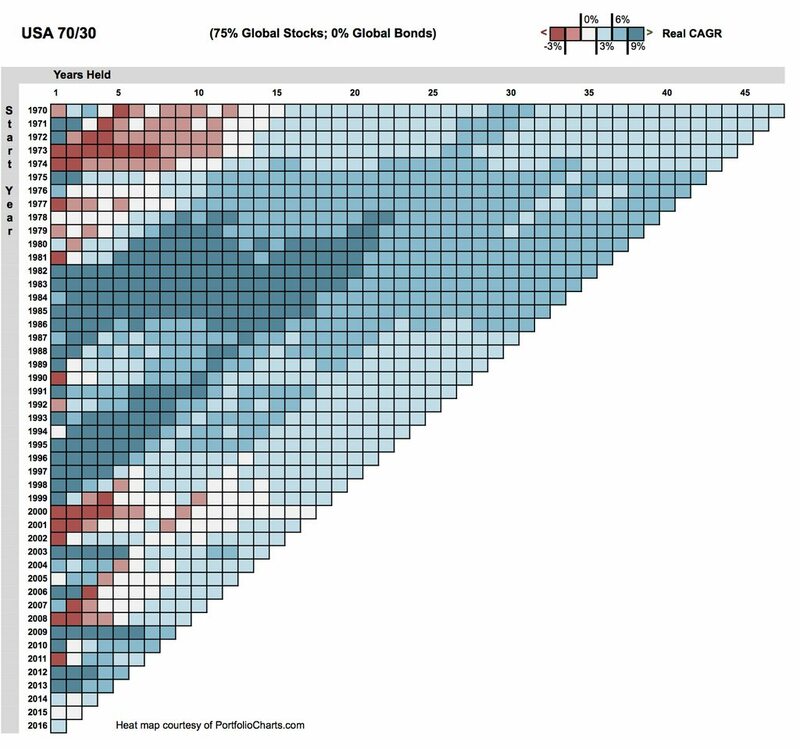 Most people diversifying internationally tend to use an Asset Allocation with X% in domestic stocks and Y% in international stocks, hence a fixed split. For our study, we’re making use of the MSCI World series, and every country is of course part of the world. We therefore need to be a bit careful when interpreting numbers, as X% World + Y% Domestic really means a domestic exposure higher than Y%. 100% World and 0% Domestic means a domestic exposure corresponding to the current market capitalization of the country (which varies over time). 100% Domestic is trivial, full home country exposure, nothing else. Say a country represents 25% of the world’s market cap. Then a 75% World + 25% Domestic asset allocation means 44% domestic exposure (and the rest is international). Say a country represents 50% of the world’s market cap (US today, Japan at some point in the 80s). Then a 75% World + 25% Domestic asset allocation means 62% domestic exposure (and the rest is international). A tilt has actually quite some advantages, as it adjusts itself when things change. A fixed split is, well, fixed. With a tilt, if the country market cap grows or shrinks, the actual exposure to the corresponding country will automatically vary. This should make ‘sticking with the plan’ easier among other advantages, avoiding to tweak your asset allocation. As the graph below (from Credit Suisse) clearly shows, the evolution of per-country market capitalization over the past century varied quite rapidly. We’re all subject to recency bias, and this graph helps reminding us how much the world can change in a decade or two. Let’s cut to the chase a little bit. 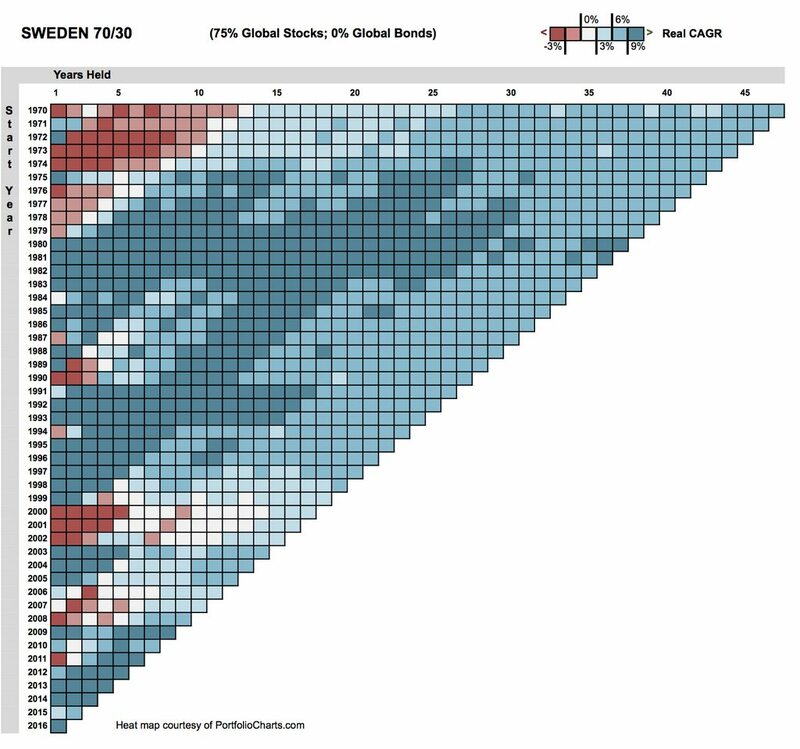 After playing with numbers for a while, the author hypothesized that splitting equities 75% global and 25% domestic would have displayed fairly good properties in the past 45 years (e.g. since 1970). It would certainly have helped a local investor in one of the countries with the worst track record (e.g. Italy, Spain, Japan) to mitigate various types of risk. And it doesn’t seem to significantly impact the performance of the countries with a good track record (e.g. USA). It does dampen the performance of the countries with the best track record (e.g. Sweden), but not overly, plus this is a consideration made in hindsight. Fact is, back in the 70s, nobody had a crystal ball allowing to guess that Sweden would do that good. Let’s check the numbers for a 70/30 asset allocation, where the equity part (70%) is split 75/25 between World and Domestic, while the bonds part remains 100% domestic. The reader is encouraged to compare side to side with the content of Part 2, which provided similar charts with a fully domestic asset allocation. Here is the usual growth (CAGR) vs. volatility (standard deviation) chart for the 1970-2016 time period. 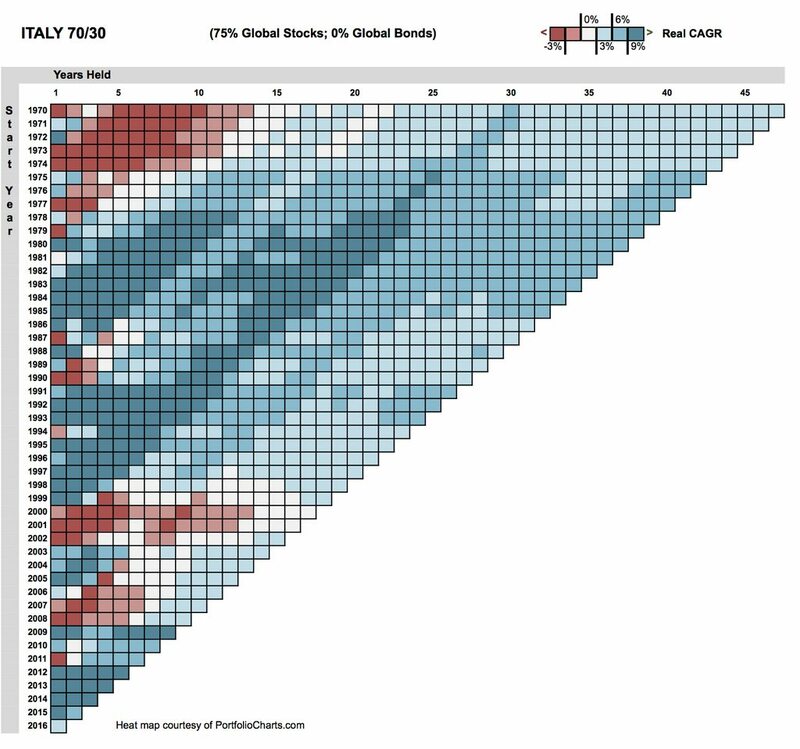 If you check the corresponding charts in Part 1 and Part 2 of this study, you will quickly notice the improvement on volatility, and the more compact distribution of growth (quite a dramatic improvement for Italy, as a case in point). Note that the CAGR for a US investor is slightly lower than for a fully domestic scenario, while the volatility is slightly improved. Now let’s look at maximum drawdowns for the same time period. This chart is certainly more satisfying than when we used fully domestic allocations. Not only is the graph much more compact (hence reducing the risk of being in a ‘loser’ country before you know it), but it shifted to the left side, and even the US maximum drawdown is somewhat improved. Spain remains an outlier though. Here are the Heat Maps for the four countries where we had a similar representation in Part 2. Quite a change for the better for the troubled countries, while the change leaves Sweden with a less stellar and yet very nice performance. Finally, let’s compute the Safe Withdrawal Rate for 30-years periods. We no longer see totally dramatic 2% numbers. Italy looks significantly better, Spain still hurts but this is getting more manageable. And the US number improved a tad too. Again, Swedish investors might cringe a bit in hindsight (losing ~ 0.5%). The previous section jumped to a conclusion, asserting that broad exposure to global stocks (while still keeping a tilt towards the domestic market and without introducing any such globalization on the bonds side) seemed a fairly solid approach. For the inquisitive and number-minded readers, more details would surely be welcome to illustrate such assertion. 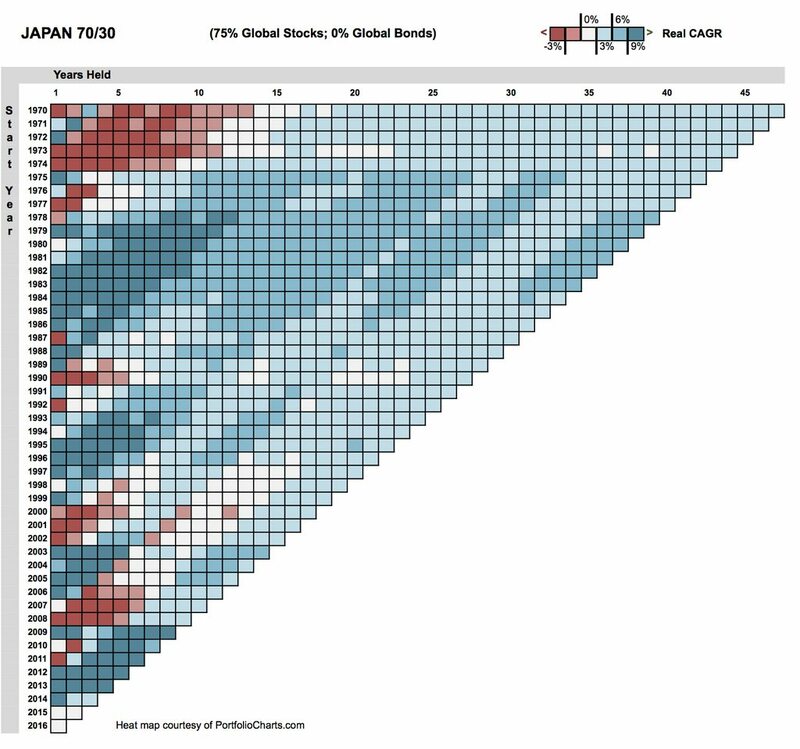 The portfolio growth (CAGR), standard deviation and maximum drawdowns are classic metrics, spanning the entire time period, and are compared below for various asset allocations and levels of global exposure. The Safe Withdrawal Rate (SWR) test is very significant, as it is directly palatable to retirees, and covers 25 time periods of 30 years (cycles). On the other hand, the oil crisis in 1973 is nearly always the worst starting date, and one could convincingly argue that such a test is centered on a single historical singularity that is unlikely to repeat itself in the exact same shape, and that it mostly ignores the sequence of events which unfolded since 2002. To attempt to make the comparison more statistically significant, one could look at a larger subset of (bad) starting years by computing a percentile on the various cycles. To do so, we can look at the 20% percentile (i.e. the lowest quintile) of the collection of cycles. To capture a more emotional perspective, the maximum drawdown certainly illustrates the gut wrenching feeling of investors during a deep crisis. This being said, we have a similar issue as for the SWR, this usually maps to the 2008/09 financial crisis, hence a singular data point. Another well-known metric is the standard-deviation of returns (aka volatility), which is often equated to (short-term) ‘risk’, but suffers from major flaws. The little known Ulcer Index does a much better job in the author’s opinion of capturing investor’s negative emotions during an entire retirement period. The following table compares the 16 countries for various levels of ‘equity globalization’ in the asset allocation, and uses conditional formatting (green is good, red is bad) applied to vertical groups of numbers as a visual aid. As you can see, it is a bit of mixed bag, while still validating our assertion that global exposure of 50% to 75% appeared to be a robust strategy. Click on the image to see a bigger version. When looking at the ‘AVG 16’ (average of the 16 countries for a given metric) column, one might notice that the CAGR decreases a bit as the various measures of risk improve. The author would suggest that this is diversification at work. As the inclusion of global bonds to further diversify, the author gave it a solid try, but couldn’t find much value (nor harm) in doing so. Finally, varying the asset allocation to 80/20, or 60/40 or 50/50 didn’t seem to alter the high-level conclusion. A fully domestic investment can deliver fairly good results, as anybody having invested in the US or Canada knows. It can even deliver very impressive results as Swedish citizens experienced in the past decades. But it can also put local investors in devastating situations, with decades-long drawdowns for both stocks and bonds (in real terms), and ruin even the most conservative retirement plans, as Spain, Italy and Japan investors went through. There is an obvious danger of placing too much reliance on the excellent long-run past performance of US stocks. The New York Stock Exchange traces its origins back to 1792. At that time, the Dutch and UK stock markets were already nearly 200 and 100 years old, respectively. 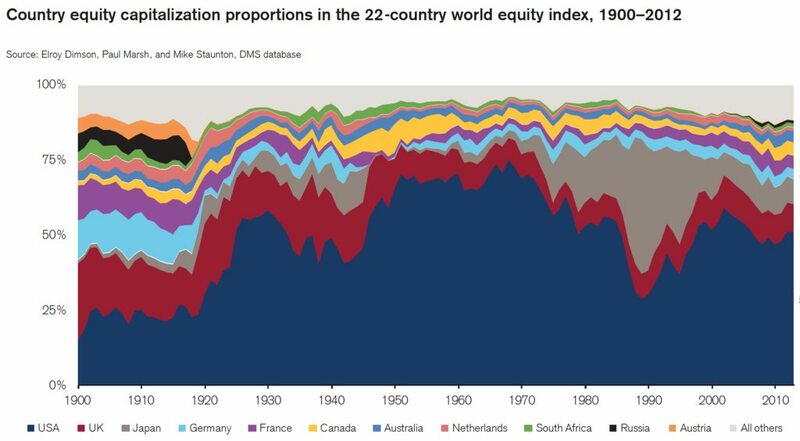 Thus, in just a little over 200 years, the USA has gone from zero to more than a majority share of the world’s equity markets. Extrapolating from such a successful market can lead to “success” bias. Investors can gain a misleading view of equity returns elsewhere, or of future equity returns for the USA itself. That is why this Yearbook focuses on global investment returns, rather than just US returns. Instead of overly relying on the past history of the country we live in, we should try to open our minds to what happened to the rest of the world and learn from it. One could always argue if one specific comparison is significant or not, or if a coarse rule of thumb (e.g. 75% global) applies in every case, but at least, this represents a solid foundation of real-life facts and history to reflect upon. The author believes that this study makes a convincing case to seek a fairly high exposure to global (or international) equities, while keeping a significant tilt towards domestic equities. Some readers might perceive otherwise, but should at least have more factual material to refine their thinking and possibly question their home country bias. The author hopes that this study will inspire various interested parties to perform more research and analysis about international data sets, based on the general idea of putting ourselves in the shoes of a local investor in a large set of diverse countries.